First British edition of this work, which chronicles Archbishop Tutu’s courageous chairing of the Truth and Reconciliation Committee. Octavo, original cloth. Signed by the author on the title page, “God Bless You Desmond Tutu 4/19/05”. Fine in a fine dust jacket. The establishment of South Africa's Truth and Reconciliation Commission was a pioneering international event. Never had any country sought to move forward from despotism to democracy both by exposing the atrocities committed in the past and achieving reconciliation with its former oppressors. At the center of this unprecedented attempt at healing a nation has been Archbishop Desmond Tutu, whom President Nelson Mandela named as Chairman of the Truth and Reconciliation Commission. With the final report of the Commission just published, Archbishop Tutu offers his reflections on the profound wisdom he has gained by helping usher South Africa through this painful experience. In No Future Without Forgiveness, Tutu argues that true reconciliation cannot be achieved by denying the past. But nor is it easy to reconcile when a nation "looks the beast in the eye." Rather than repeat platitudes about forgiveness, he presents a bold spirituality that recognizes the horrors people can inflict upon one another, and yet retains a sense of idealism about reconciliation. With a clarity of pitch born out of decades of experience, Tutu shows readers how to move forward with honesty and compassion to build a newer and more humane world. New York: Doubleday, 1999. First American edition of the Nobel Peace Prize-winning work which chronicles his courageous chairing of the Truth and Reconciliation Committee. Octavo, original half-cloth. Signed by the author, “God Bless You Desmond Tutu Mar 2006 Capetown.” Fine in a fine dust jacket. 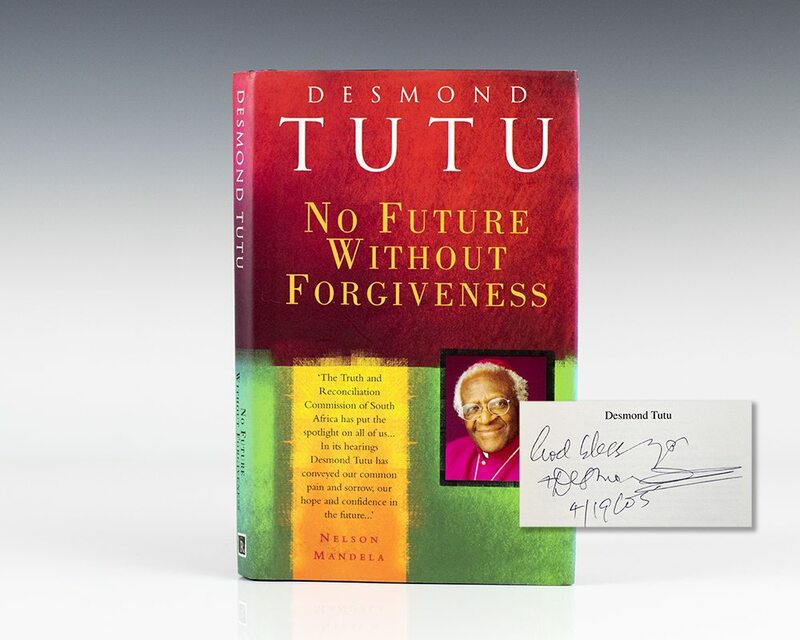 Tutu, Desmond; Foreword by Nelson Mandela. The Rainbow People of God. First edition. Octavo, original half cloth. Signed by the author, “God Bless You! Desmond Tutu July 95." Fine in a near fine dust jacket with light shelf wear. God Has a Dream: A Vision of Hope for Our Time. First edition of this powerful work by Archbishop Tutu. Octavo, original half cloth. Signed by the author on the title page, “God Bless You Desmond Tutu June 2004” on the title page. Fine in a fine dust jacket. Jacket design by Kathleen DiGrado. Zen and the Art of Motorcycle Maintenance: An Inquiry into Values. New York: William Morrow & Company, 1974. First edition of one of the most important and influential books written in the past half-century. Octavo, original half cloth. Boldly signed by Robert M. Pirsig on the front free endpaper. Very good in a very good dust jacket. Jacket design by Paul Bacon.